Jon Collins, a member of the Bury St Edmunds Chess Club, participated in u180 section at the 2015 British Championships in Warwick a few weeks ago. This was a five round Swiss in which Jon, graded 163 ECF, started the event as 16th seed from a total entry of 36 players. In the third round, Jon handled the endgame much better than his higher graded opponent, the 3rd seed Ian Clarke (180 ECF), and secured the win. After an amusing nine move win in round four, Jon was joint leader on 3½ points and a draw would be enough to guarantee a share of first place. 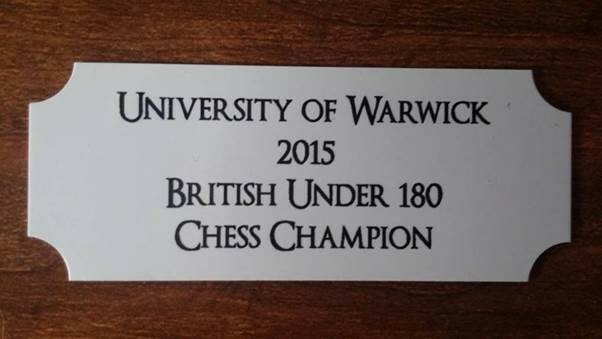 A draw was duly achieved and with a total score of 4 from 5 games, Jon became (joint) British u180 Chess Champion. Well done Jon!